The Encounter restaurant at LAX has been closed because of structural difficulties. Please stand by. Inspectors uncovered the problem after a 1,000-pound piece of white stucco fell off the underside of one of the arches and smashed into the eatery’s roof. Uh, the loud noise made by the half ton of falling stucco didn’t somehow indicate the problem? Dude! (Sorry, Doog!) That’s hawesome! Stucco doesn’t make much noise when it falls, only when it hits something! what if nobody’s there to hear that stucco staccatto? i hope they fix it soon. 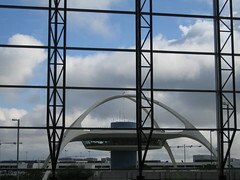 i like this LA architectural icon.